Kenneth Jennings Interview with Bruce Duffie . . . . . .
Kenneth Jennings (b. 1925) is Tosdal Professor Emeritus of Music at St. Olaf College and Conductor Emeritus of the St. Olaf Choir. A graduate of St. Olaf, he sang as a member of the St. Olaf Choir as an undergraduate. He holds a master's degree in composition from Oberlin Conservatory of Music, and a doctorate in choral conducting from the University of Illinois. He was appointed to the faculty of St. Olaf College in 1953, and ascended to one of the world's most coveted choral podiums in 1968 as the third director of the internationally renowned St. Olaf Choir, succeeding founder F. Melius Christiansen and his son-successor, Olaf C. Christiansen. He retired from St. Olaf College in 1990, turning over the podium to his former student, Anton Armstrong. His Son, Dr. Mark Jennings, is the director of Choral Activities at Truman State University in Kirksville, Missouri. As director of the St. Olaf Choir Jennings became noted for guiding and maturing the group from one rooted substantially in its 1911 era founding to arguably one of the most highly respected choral ensembles of the world. Never forsaking the choir's Lutheran heritage, he successfully broadened the ensemble's repertoire to include works of noted composers of the post-World War II era. He led performances of the St. Olaf Choir in all major performing centers of the United states and many in Europe and Asia, including music festivals in Belgium, France, Germany, Holland, Italy, Norway and Korea. Under his leadership, the Choir also had a long and distinguished collaboration with the Minnesota Orchestra under the baton of Stanislaw Skrowaczewski and Neville Marriner. Since his retirement, he has served as a visiting professor and choral conductor at Gustavus Adolphus College in St. Peter, Minnesota and The University of Arizona, Tucson. Jennings served as the guest conductor at anniversary concerts in honor of F. Melius Christiansen. His continuing work as a composer includes commissions from the Dale Warland Singers, Cantus, Luther College, Gustavus Adolphus College, Kansas All-State Choir, Angelica Cantanti Choirbrook and the Choral Masterworks Series of historic recordings of the St. Olaf Choir. His numerous compositions and editions are widely published. Besides my work at WNIB, Classical 97 in Chicago, I spent a year and a half with Music in the Air, the company which provided the entertainment package aboard several airlines. I selected the music and was the voice of the Classical Music program on United Airlines, which was also given to Air Force One, the presidential jetliner. I also did a few special programs for Delta, Eastern, and Northwest. 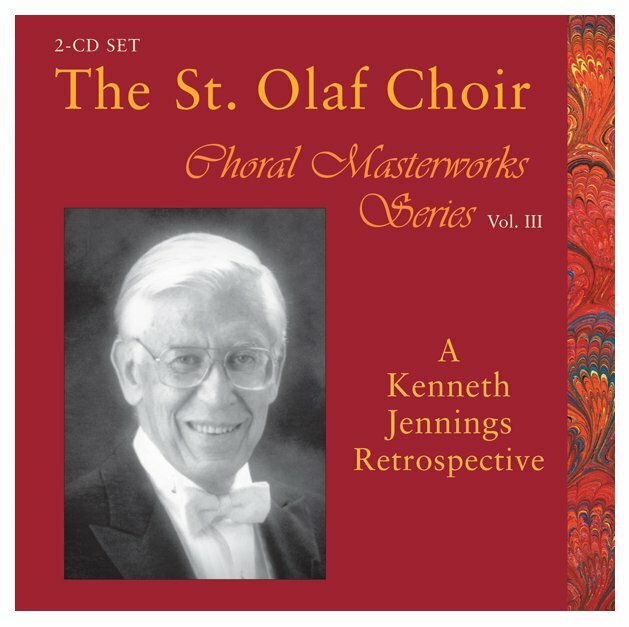 At the beginning of June, 1988, they asked me to do an interview with Kenneth Jennings, the conductor and Music Director of the St. Olaf Choir in Northfield, MN, for use on Northwest Airlines. I gladly agreed, and the appointment was set up to speak with him on the telephone. What follows is a transcript of that conversation . . . . . . .
Bruce Duffie: You are the director of the St. Olaf Choir? Kenneth Jennings: Yes. This is the end of my twentieth year. I started in 1968. BD: Tell me the particular joys and sorrows of working with a group of human voices. KJ: The joy is the fact that this is a human instrument, not a man-made instrument, and it involves people doing what people can do. There is also, the fact that I’m dealing with young people, undergraduate college age, delightful, responsive people who have not become too professional yet and therefore still dare to express themselves, in a less inhibited way than older people. I like to conduct these people, but there are all kinds of problems, of course, because they still are young and not very experienced. BD: Does it become more of a problem as they become older and perhaps become more professionally aligned? KJ: For some people, certainly, this becomes a way. These people, the ones we deal with, are just in the beginning stages of musical and vocal maturity. They are still discovering a great deal about themselves and what music and the world is about. When one gets a little bit older, sometimes some of our experiences create more realistic or different impressions that are not as spontaneous and youthful and vigorous, and sometimes as beautiful. BD: What is the size of the choir? KJ: The choir runs between sixty-five and seventy. I think it will be sixty-eight or sixty-nine this summer. BD: Do you always try to stay around that number? KJ: We do for various reasons. We can fit that number on two buses when we travel. The size of the hall we sing in requires some body of tone, and while we do not need as many, with the young singers it fits us better. When we do tour, we’re usually under a great deal of pressure. We have many concerts in a short space of time, and a few are going to have colds and a few are not going to feel well because of travel and so on. So this gives us a little cushion of some people even when we’re not all operating one hundred percent. BD: Do you select the voices that will go into the choir? KJ: Oh yes, and that’s rather a long and complicated process. BD: What do you look for when you audition a singer? What do you look for before you decide whether or not this particular voice will fit into your choir? KJ: I look for several things. One is simply someone who really likes to sing, who has a lyric personality and who wishes to sing, enjoys singing and wants to. Then one looks for a very healthy voice, a voice that does not have a lot of built-in problems, that works basically fairly well. Since most of these students are still beginning, many of them are not so advanced. The third item that we look for is simply a very good ear — people who hear quickly and alertly and can match pitches very quickly and very well. The ear is very important in all music, but it is absolutely essential in singing. If one does not hear it very clearly, then one is not going to sing it very clearly. In instrumental music, there’s always the aid of the keys and the placement of fingers to help secure pitches, whereas singers must hear it in their heads. If they can’t hear it in their heads, they cannot sing it, so the ear is very, very important. So we look for a very good ear, a healthy voice, a naturally well-produced voice, and a spirit that wishes to sing, likes to sing and knows how to communicate. BD: About how many do you have audition, and about what percentage of them do you take? KJ: It’s about one in five that we take. BD: There is that much of a screening process? KJ: Yes, and then there’s a good deal of self-screening before they come to see me. We take in about thirty, and we will have as many as two hundred audition. BD: These are all from the college? KJ: Yes, they’re all college students. BD: Is it at all frustrating to know that there will be a forced turnover every year? KJ: We’ll take in not quite half a new choir. First of all, they’re here only four years, and I very seldom take a freshman or a new student just coming into the college. So we have about three years, and in one of those years as many as fifty percent of the group that might be available may be traveling and studying in places other than St. Olaf because we have a very large international program. So probably most of them, a large majority of the students are in about two years, and that means almost fifty percent turn-over every year. BD: So with half the new choir then essentially you’re dealing with a new instrument each year. KJ: A new instrument and sometimes a very different instrument. BD: Does the kind of instrument you wind up with each fall help to dictate the repertoire you will sing? KJ: Absolutely. One can make some choices about the things you think will probably work, but there are some choirs that are much more lyric and some choirs that are more dramatic. So there’s always a choice of repertoire that reflects that particular personality of the group. BD: Do your soloists come from within the choir or from elsewhere? KJ: Usually from within the choir. BD: How do you select those? KJ: By the time I have gone through all these audition processes and worked with the students almost every day for a year, I know pretty well what they can do. Many times we hold auditions for those solo spots. It takes a particular kind of voice to do a particular kind of solo. BD: I would think that the voice which would work well in the solo would not be the kind of voice that would blend with the choir. KJ: It depends on how they sing. Those with very good ears and very healthy voices have no problem. It’s the peculiar kind of solo productions that sometimes cause difficulty, but for the most part that’s not a difficult problem. BD: I assume that most of the repertoire that you’re singing is four-part part SATB? BD: Do you also divide it differently on occasion, or use all women or all men for special numbers? BD: So essentially each one was a soloist? KJ: Well, each one has a part. BD: Do you do a lot of new music? KJ: We do quite a lot of new music. For our program for this summer, outside of a Bach motet, all the rest is Twentieth Century American music. BD: What advice do you have for a composer who wants to write choral music? KJ: That’s a very good question. I’ve always been a little puzzled by all the composers that we have sitting in all the universities and colleges in the country. One of the main ways composers earn their living is being on faculties of music schools, so why do they ignore this area as much as they do, and write works for the symphony orchestra which will likely not be played very often? They have so many built-in choral groups within these colleges and universities. First of all, they need to listen to choruses and they need to know something about voices — as much as they know about clarinets and flutes and violins and strings and brass. Most of the training is via the instrumental side of things. We talk about orchestrations, and everybody just assumes that they will automatically know how to write for voices. But to write well for voices takes a lot of experience and a lot of listening and a lot of careful attention to what works. For example, take a C Major chord. If you put the tenors on Middle C and the altos on the E and the sopranos on G, when you put the basses down an octave below the tenors it’s a very mild sounding sonority. But if you move the basses up one octave, that sonority will change radically and become enormously stronger. It’s that kind of thing. If you do that on the piano, it doesn’t mean a thing. An orchestral student would probably miss that entirely in terms of sonority for choruses. BD: Is there any correlation between that and putting the cellos up with the violas? KJ: Yes, but even stronger. Think of forte chords with the basses up the octave. You can move them up to D or E Flat and it would be enormously powerful without changing a thing except that the basses are moved up an octave. It is for that kind of adjustment, knowing what works well and what will sound. Then it’s the whole other dimension of music-making that the instrumentalist has no real awareness of, and that has to do with text, which is simply another element which does not involve instruments at all. BD: Do you work terribly hard on the diction of your choirs? KJ: Oh indeed. To get an elegant diction that conveys and is able to be understood well takes a lot of work because most of us are pretty sloppy in the way we speak. Young people have generally not been advanced terribly far in their handling of text in a very poetic musical fashion. It’s one thing to put on an ending T or D, but putting something else into an artistic part of the whole is quite another matter. BD: Coming back to the members of the chorus for just a moment, are most of these students going on to professional degrees in music or are a lot of them in engineering and sociology and things like that? KJ: The vast majority of them are not music majors. We come from a peculiar college where the music has always been a very important part of students’ lives. However, only a small part of those people are in it in a professional way that is preparing for professional lives in music. As much as a quarter to one-third of the college is involved in some kind of music making, so the vast number of these students are not music majors. However, they come here because they know that they can study music and can be involved in music even though they’re not going to major in that. We teach over eight hundred private lessons to students every week out of the college that’s three thousand. There is a very large number of students studying individually with private teachers. Many of these people are in it as an avocation, but as a very serious avocation. They will probably carry on in making music of some kind for the rest of their lives, even though they may become bankers or lawyers or engineers or doctors or what have you. BD: Do you think that this is perhaps a very special way to get more music out to more of the community than just through professional players? KJ: I think it has happened this way in terms of alumni of the college. For the past seventy five or eighty years there is a vast group of people who have participated in these kinds of programs at St. Olaf. This moves us out into the community, and it certainly has been very important to us. I know students who go to other universities, and when they go to audition — say they go to Yale and to the Yale Glee Club. When they ask, “Where are you from?” they’ll say, “St. Olaf,” and they put them right in. Even if they haven’t sung in anything they think that’s a good place because they say they’re from St. Olaf. Many people tell me, “They think that I should be able to conduct a choir just because I graduated from St. Olaf.” That has been true as the choir for seventy five years has moved across the country on tour every single year, particularly since 1920. We are probably the oldest touring group in the country that is still doing it, professionally or otherwise. BD: Tell me about making records. Do you sing any differently in the recording studio than you do in the concert hall? KJ: For the most part our recordings are made from actual performances. I prefer to do it that way. I tried the route of the recording studios, but they are not the most pleasant places to perform. There’s something electric about a live performance, and if you happen to hit a very good performance, I prefer to take the actual doing of the music and not the artificial way of producing a recording and going through a recording studio. Maybe it’s because they’re young people or maybe it’s because of me, but we have found that we do much better when it is live, so all of our recordings are made from live performance. BD: Do you then record every performance you give? KJ: Yes, most of them. We don’t record everything we do on the road, but everything we do here at the college and where we have adequate recording facilities we do. BD: Then you have quite a large choice then when you want to issue recordings. BD: Have you basically been pleased with the recordings that have come out? KJ: I’ll say yes and no. Recording a choir seems to be a very difficult thing to do. The engineers tell me that there are overtones and voices which they find very difficult to capture in the right way. There’s the problem of the spatial sensation that one has in a room, and the kind of rolling effect that a recording can create. There is a confining or boxing of the sound that makes it concentrated and not feel as open and free as it does in the actual concert hall. I’m always trying to get them to find the right balance of mike placement that gives us that sense of openness and clarity and ambience of a concert hall and not of an artificially added reverberation in a basically dry recording. This seems to be more difficult, at least they tell me it’s more difficult than recording an orchestra. I never could quite believe that, but that’s what they tell me. Either that or they don’t have the experience of doing it. BD: Perhaps that’s it — the lack of experience and knowledge as you were saying about composers! KJ: I had thought that perhaps that’s it. You can record things in many different ways. The usual is the layering effect that they do in popular music where you lay one thing down and then another and then another. One can record all the highs and then say, “We’ll add the lows when we use our mixers and so on.” Also, many of them like to record extremely close. It’s one thing to record one instrument close, but another thing to record a whole group of twenty singers close. Obviously you’re going to get those who are closest to the microphone to sound simply closer. So to pick the right spot where the sounds come together and actually do mix in front of the group is quite difficult. BD: But you do find it occasionally? KJ: I think we find it occasionally. So yes I can be pleased. What I look for, of course, is the best performance that I think we can do and then I say, “Let’s see what else we can find.” I’m a little fussy about what I do put on records. A recording is like photograph in that it only shows one angle, one possibility at that particular moment in music. Sometimes it catches what is most attractive and sometimes it does not. I’m pretty fussy about that, so we don’t put out a recording every year. We record every year but it takes me sometimes a year or two to get enough distance on it so that I can be objective about the value of what we’ve done. BD: Let me ask you a great big philosophical question. What is the purpose of music in society? KJ: That is a very big question. I think that all living things — animal living things, at least — communicate in some kind of way. Humans are the only ones that have an organized kind of communication through speech and through concrete meanings of that speech. I suppose the birds sometimes are just singing songs, but we know that they are communicating in some way there, too. They’re either warning other birds not to come near by or inviting more birds to come. There’s been some studies about whales and all the communications they make. They make various beeps and sounds that can be recorded, and some people think they’re quite beautiful. Further, it seems that humans in every society have always had some kind of music. This is an aesthetic thing. The sound is something that goes with the spirit of being human, and “aesthetic” means “spirit” in its original sense. There seems to be something in people, in humankind, that needs this and so it has come into every culture. Certainly in our particular day and age music doesn’t solve mathematical problems; it doesn’t solve engineering problems; it doesn’t solve health problems. It is not that kind of thing, but it is the spirit of giving that is one of the things that makes us human and seems to be kind of a need which we all have. This is organized in many different ways. Right now we organize it through orchestras, choirs of solo singers and ensemble singers, ensemble players and so on. This, of course, has changed from period to period. Various kinds of groups have encouraged it — the church or the state and the society at large — but it seems to me that it’s a pervasive part of being human, and I hope we always have it. I would worry quite a bit if we didn’t, although I could get along without the elevator music. KJ: Oh yes. I don’t have any doubts about our making music; it’s a question of what kind of music we might be making in the future. What kinds of music might be meaningful and what might be meaningful to me at my age and spirit-giving may not be the same as what’s going to happen to young people later on. BD: Is there any difference in your performance when you’re singing a sacred work as opposed to a secular work? KJ: From a technical point of view, no. I would put just as much of whatever I know and whatever I can get singers to do in a secular piece and a sacred piece. The music itself is not necessarily anything different; it’s the occasion for which it’s used and the text that’s involved that creates something that we call “sacred” or “secular”. But we will try to sing it just as beautifully and just as well whether it’s a Debussy chanson or a Bach motet. KJ: It depends on what you mean by “meaningfully”. I would say with the same kind of artistic integrity, yes. If the meanings come out differently, that’s the meaning which emerges from within. There are many things that make people feel that they’re going to create at their maximum level of ability, and it may be that for some, thinking in sacred terms and the meaning of the text will some way elicit a sense of awe or a response that someone might deem richer and more meaningful. But if it’s a good piece of music, its artistic integrity should hold in terms of performance either way. BD: What do you expect of the audience who comes to see one of your concerts? KJ: In some way I would expect them to be taken up by the music so that they are in a responsive mood that in some way moves them. There are many entries into art. For some people it’s going to be through the sheer sound of the group, for others it may be on a deeper level of musical meaning, and for still others the entry into it may be through text and what they perceive to be the meaning of that text that comes through the music. Most audiences are comprised of many different levels of listening and abilities to respond, so one would hope that many of these levels would be reached for the different people who come and experience. We hope to move them in some way so that they feel enriched in spirit. BD: Does the response of the audience affect your performance? KJ: The students who sing in this group are humans and they feel it if there’s a very positive response. If the people like what they’re doing and they’re enjoying what they’re doing it’s a reciprocal kind of response. All artists respond this way. If you feel that you’re not reaching your audience and they are turned off by it, it’s more difficult to continue to try to reach out and do your very best. But we all enjoy the fact that the people we have in front of us are listening and enjoying what we’re doing, and that some way makes us respond. If you ever have an audience that just sits on its hands and doesn’t respond, that is more difficult. BD: Do you look at the group as sixty-eight individuals, or do you look on it as one unit? KJ: I think both. They are sixty eight individuals whom I know really quite well, and I know that they are all contributing certain kinds of talents. Some of them are different. Some have more voice, some have better ears, some have spirit, some are more artistic, but all these things move into making what is the choir which is a unified whole. It is a cooperative thing, and we do have to find people who wish to cooperate that way. That’s part of the lyric spirit I was talking about before. It is also a cooperative kind of spirit; people who enjoy doing things together. We have such a cult of individualism in this country that to get a group of people to come together to respond to musical nuances together is rare. It’s a growing, developing kind of thing which we work on for a long, long time to get us that electric point of immediate response and sensing that we’re all responding together in a manner which creates one thing up there. So the choir is a group of individuals who come together to share a common experience and to create a oneness with one another. BD: That’s a wonderful way of looking at it. Is conducting fun? KJ: Yes. [Laughs] It’s fun, it’s also hard work, but it’s a delight. I’ve not conducted now for two weeks. A pianist or anyone who plays an instrument can go and pick that instrument up and play it or do some practicing. But a conductor often has to take three months or four months of conducting nothing but his imagination and the air in front of him or her. There is no way to practice your instrument, so to speak, and you have a very limited number of hours that you actually get in front of the group. So when one has that opportunity, it’s always thrilling to be able to do that. I enjoy it. BD: With such a lack of opportunity to practice, how does one learn to be a choral conductor? KJ: That’s a very good question. You have to have a group. I was just reading the biography of Berstein, which I did not enjoy very much. It talked about Kousevitzsky who married a very wealthy lady who then was able to give him the opportunities by buying him an orchestra so he had something to practice on. The rest of us have to get a post, and once you get that post you’re faced with the responsibility for the outcome of that particular group. It’s through that that you learn. I don’t know any other good way to do it. BD: I would assume they won’t give you a post unless you’ve learned how to do it. KJ: Yes. There’s some basic things, of course. The actual motions of conducting are quite easy, but the problem is listening and being able to diagnose what things are good and what things need to be improved. That takes years of experience. For our young conductors here, we have just instituted a new setup for conducting. Most of them have had only one or two semesters in conducting, and then in some way or another for the rest of their lives they’re supposed to know how to do it. So we have just changed that to start them now at the sophomore level. We include both the instrumental and the vocal people together. The instrumental people play the vocal music and the singers sing the instrumental music, so they get a chance to see how both people are starting to operate in terms of making music in front of people. Then we move on to two separate categories of choral conducting or instrumental conducting. They can take both of these since they’re at different times, and they can continue on with that. Then we have another semester in which they can take which is called advanced conducting. It’s only a few people who do this, so it’s sort of a one person kind of affair. They go out and get their friends to form a group. They set up rehearsal times and they select some repertoire that they think they can do, and they take about eight weeks of rehearsing this group once or twice or several times, two or three or four hours a week. Then they perform and they learn an enormous amount having to be responsible for the formation of their own group and for the success of that group. We also try to give them some podium time. In this case, with advanced conductors, it’s fully a time for which they’re completely responsible. It’s not somebody else’s group, it’s theirs. It’s worked out really quite well, and those that have had those experiences have a better opportunity to go out and try to create music with other established groups. But it does take years of conducting before you are a good conductor. BD: I’m looking over the list of the music which will be on this particular program on Northwest Airlines, so let’s talk just a little bit about some of these pieces. First is the Brazilian Psalm by Jean Berger (pronounced as in French, zhahn bare-ZHAY). Is he still alive? KJ: Yes. He lives in Colorado. He was one of my teachers at the University of Illinois. He also runs a company called “John Shepherd Company” which is what Jean Berger would translate to in English. He’s very interesting fellow. Brazilian Psalm is a piece that he wrote just after World War Two for the Westminster Choir. Jean Berger (1909-2002) was born Arthur Schloßberg into a Jewish family in Hamm, Westphalia, and grew up in Alsace-Lorraine. He studied musicology at the universities of Vienna and Heidelberg, where he received his Ph.D. in 1931 with Heinrich Besseler as his advisor. He also studied composition with Louis Aubert in Paris. While working as the assistant conductor at an opera house in Mannheim, he was forcibly removed from a rehearsal by Brown Shirts. After the Nazi Party seized power in Germany in 1933, he moved in Paris, where he took the French name Jean Berger, and toured widely as a pianist and accompanist. From 1939 to 1941, he was assistant conductor at the Municipal Theater in Rio de Janeiro and on the faculty of the Brazilian Conservatory. He also toured widely throughout South America. In 1941, he moved to the United States and served in the U.S. Army starting in 1942. In 1943, he became a US citizen. He worked in the Office of War Information producing foreign-language broadcasts and USO shows until 1946. From 1946 to 1948, he worked as an arranger for CBS and NBC and toured as a concert accompanist. In 1948 Berger moved into the academic world, taking a faculty position at Middlebury College in Middlebury, Vermont, which he held until 1959. From 1959 to 1961, he was on the faculty of the University of Illinois at Urbana-Champaign. From 1961 to 1966, he taught at the University of Colorado at Boulder and then the Colorado Women's College in Denver from 1968 to 1971. From 1970 on, he lectured widely throughout the world on various aspects of American music. BD: If memory serves me correctly, he’s going to be eighty next year. KJ: He would be eighty next year, that’s right. He doesn’t look it at all. He still looks like he’s about fifty five... at least the last time I saw him he did, a few years ago. He’s a very, very interesting person. [As has been noted elsewhere in this series of interviews, I always jumped at a chance to make further contacts whenever possible. Jennings provided me with a phone number, and the interview took place about a month later. To read that interview, click HERE.] At any rate, this piece was not sung by the Westminster Choir. They thought it was too difficult and Olaf Christenson, my predecessor in the St. Olaf Choir discovered the piece. He took the last part of it, which is the part which you hear on this recording, and sang it with the choir. It was an enormous success and that’s the way John Berger got known in the choral field. It was for that one piece and the St. Olaf choir singing of it. BD: Next is The King Shall Rejoice, one of the Coronation Anthems by George Frideric Handel. KJ: Yes, one of those great pieces that is great fun to do. We also did that piece with Neville Marriner a year or two ago. BD: When you do a work with an orchestra, who winds up with the ultimate musical responsibility — you the choral director, or the orchestral conductor? KJ: The orchestral conductor usually gets to it if it’s Marriner or Skrowaczewski. [See my Interview with Stanisław Skrowaczewski.] They’ve always conducted, but I prepare the chorus. I always prepare them as if I was going to have to conduct it, so they’re well prepared before the conductor sees them or hears them. But orchestral conductors haven’t the faintest idea what to do with a chorus. They just say they conduct the music, you see. BD: Is that ultimately right — that they should just conduct the music? KJ: No, I think that they ought to conduct the chorus and what it tries to do. Marriner has a little sense of this, but when I’ve worked with them they’ve always treated us as a soloist. A soloist comes and knows what they’re doing and they respect that, but they really have very little to say. Tempos may be different from what we do, but when we’ve worked with the orchestra we meet with the conductor for one or two rehearsals so we have an idea of what they would like from the chorus. BD: It sounds more like coordination than instruction. BD: Have you ever done any work with opera? KJ: We did a concert version of Magic Flute with Skrowaczewski some years ago, but no, I’ve not had a lot of doing with opera. I’ve had students who have sung opera, but I, myself, have not conducted it. BD: Another recording that we’re going to use is the Neue Liebeslieder Waltzes, Op. 65 of Brahms. Is this a special piece in any way? KJ: It’s the second set that Brahms published. Actually he had written a lot of these pieces and then published the first set. Some of the ones that he put in the second set were things which he had written previously to that. I feel that it is a little more of a whole than the first set, and a little more varied in a way. Both sets have some wonderful pieces in them and I enjoyed this set in particular. It’s one that fits our group perhaps a little bit better than the first set. There are fewer duets and less exposure of high tenor parts. I think that it works together as a whole and therefore it makes a little bit better concert piece. Plus it’s a little shorter and there aren’t quite so many pieces. KJ: Yes, that’s “Norway, my Norway!” We did that when we did a tour in Norway. That’s an interesting piece. To the older Norwegians, it’s a little like our “America the Beautiful.” They have their national anthem and this is sort of a second national anthem. KJ: It’s very much of a favorite. The man who wrote the music — his name is Paulsen — was an immigrant to this country and lived in Nebraska. He wrote quite a lot of music, and this piece got to be known in Norway and became an enormous favorite. The poet, whose name I can’t recall at the moment, was a very unusual man too. He was a Norwegian Jew — if you can imagine that — and so here we have a Norwegian-American who writes the music and a Norwegian Jew who writes the text, and this becomes one of the great favorites of Norway. It’s a very beautiful piece of music. I like it very much. It has some very sentimental qualities to it, and is one of the pieces we did as an encore. BD: It sort of lends credence to the idea that music is the universal language. KJ: Yes, yes it does. BD: What is next on the calendar for Kenneth Jennings? KJ: We are going to Seoul, Korea later this summer, and will sing about five concerts there during the Olympics. BD: You tour so much. Is going to the Olympics a special tour, or is it just another tour? KJ: It’s a special tour, but we did a month long tour to the Orient two years ago. The group usually takes an international tour every four or five years. We tour in the U.S. every year to different parts of the country. This next season we go to the Southwest. We fly to Denver and then take buses from Denver through the Southwest to California and up to San Francisco. Because our time is about two weeks that’s as far as we can get and then we fly back from there. We go out for about two weeks, sometimes two weeks and a weekend; that’s about as much time as students can afford to be away from campus. That is our vacation between semesters. The following year we go out to the east coast in New York and Washington, D.C. and do some concerts there. So we go to the Northeast and to the Southeast and to the Middle West and to the Southwest and to the Northwest. Those are out five different areas. We used to do a whole Eastern trip and then a whole Western trip from the state of Washington all the way down to San Diego and then back again, but those were the old days when we could travel by train and we’d take night coaches to get to the next place. That gets very tiring, and the choir in the older days stayed out at least a week longer than we can now. BD: Is it basically your responsibility as the director to make sure that the singers don’t sing too much and over-sing their voices? BD: Thank you for spending time with me this evening. It’s been a great pleasure speaking with you. KJ: You’re very welcome. I’ve enjoyed it very much. Note: When interviews are posted on this site, I attempt to contact my guest and/or their family or agents to let them know of this further use of the material. Usually this is long after the original meeting, and occasionally I get a response. In this instance, I soon received a lovely e-mail reply, part of which is shown here . . . . . . .
What a great surprise to read this interview from 25 years ago! As I remembered, it had not gone too badly. I never enjoyed being interviewed as conductor of the choir, but I did enjoy talking to you on this occasion. A very big thank you for resurrecting it from the depths of your surprisingly long kept files of interviews of so many years ago. Close now to 88 years old and retired for 23 years I have had great pleasure reading what I thought about regarding music, conducting and the choir some 25 years ago. Thank you so much for finding this old interview and for your questions that facilitated my answers. 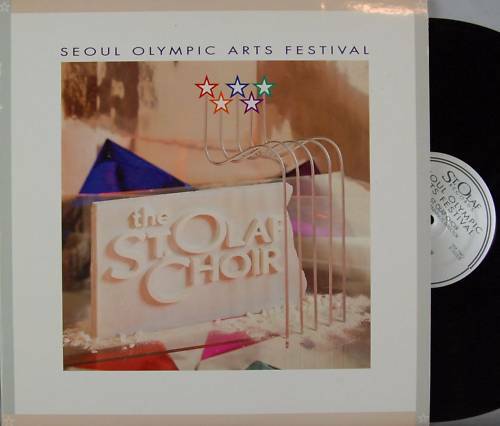 I believe that you were looking at St Olaf Choir recordings for listening channels on Northwest Airlines (now swallowed up by Delta) perhaps in light of the Choir's trip to Korea and the Summer Olympics. I can't be sure that it was not prompted by the fact that the plane was being piloted by Bob Matta whose daughter Michelle sang in the Choir. Nonetheless, when we boarded the plane we found that Bob Matta was indeed the pilot and St Olaf choir was on the classic listening channel! We sang 5 or 6 concerts in Korea that summer including one in their very new concert hall. Bruce, thank you for finding our interview and sending to me this very special remembrance. This interview was recorded on the telephone on June 1, 1988. Portions (along with recordings) were used as part of the in-flight entertainment package aboard Northwest Airlines during July-August, 1988. This transcript was posted on this website in 2013.